Sols 2308-10, February 1, 2019, update by MSL scientist Vivian Sun: Curiosity successfully completed her drive yesterday and is currently parked on top of one of the ridges (“Knockfarril Hill”) in the clay-bearing unit. One of the mysteries of the clay unit is the origin of these ridges – how did they form and what are they made of? This weekend’s 3-sol plan is packed with observations designed to start addressing these questions. The current workspace in front of Curiosity is very rubbly, with no bedrock that is reachable by the rover arm. However, most of the clay-bearing unit is likely composed of this rubbly material, so it’s important to characterize its composition and texture. To that end, we will acquire APXS measurements of this material on Sol 2308, using a rastering technique where the APXS will be placed over three overlapping spots in the workspace. By obtaining chemical measurements over different, but slightly overlapping areas, we will be able to distinguish the compositions of the pebbles from the sand and soil in the APXS field of view. 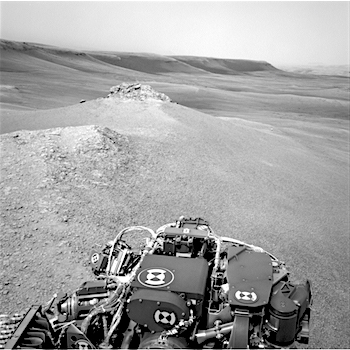 This entry was posted in Reports and tagged Aeolis Mons, Brent, Carluke, CBU, clay-bearing unit, Crawton, Curiosity, Foveran, Gale Crater, Knockfarril Hill, Mars Science Laboratory, Mount Sharp, MSL, Murray Formation, NASA. Bookmark the permalink.